BOSTON – For Boomers, the ideal shopping experience is about getting a good deal on a decent product. For Gen Y, it’s more about a stimulating, sensual, “sharable” experience. Think sensible shoes vs. smart phones. This practicality divide is among the many discoveries in a new in-depth study on retail by Brodeur Partners, which is introducing quantitative social science to the often subjective practice of communications, branding, public relations and social change initiatives. The Brodeur Partners’ Retail Relevance 2012 Study (PDF) used maximum difference scaling methodology to precisely identify what is most and least relevant in a shopping experience. The study asked 2,000 American consumers to think of their favorite place to shop and identify those elements that were most and least relevant. Sharability of the experience and “association” (I’m ok if people know I’m associated with it) are twice as important to Gen Y (18-34) as to Boomers (55-plus). Sensory appeal and the ability of a retailer to “make me smile” are one-third more important to Gen Y than to Boomers. 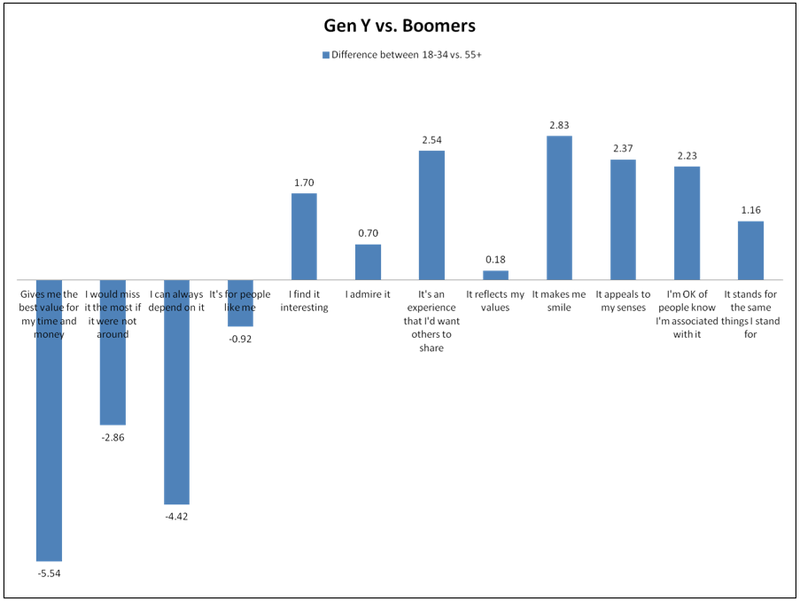 Practical decisions drive choice of retailers for 8 out of 10 Boomers, but only half of the Gen Y respondents. And though sensory experiences clearly matter, Johnson warns retailers that they can’t simply barrage the Gen Y consumer with loud music, seductive smells and images of beautiful bodies: the research indicates retailers need to focus equally on the social aspects of the experience, and be a brand with which a consumer would want to associate. The survey builds upon relevance research Brodeur released a year ago, which found that many companies have “leading relevance indicators,” or main ways consumers connect. For example, they may primarily excite (Apple, Target and Red Bull) or communicate shared values (Ford) or stand for dependability (Wal-Mart). High relevance scores correlate with superior growth and performance, according to that research, even when a company is dwarfed by industry juggernauts. “Our agency focuses on relevance because it’s unequivocally the most important consideration for brands in our increasingly busy communications environment,” said Brodeur CEO Andy Coville.